Recorded in several forms probably including Kermode, Kermott, Kermitt, Kermatte, and Kermath, his unusual name is believed to be a contracted form of the Irish surname "MacDermott". As Kermode it is found mainly on the Isle of Man, and in the Irish province of Connaught, whilst the other spellings appear to be mainly recorded in England. The name "Dermott" is from the Gaelic personal name "Difharmait", composed of the separative prefix "di", with "farmat", meaning envy. The translation is one who is "free from envy". In Celtic legends this was the name of the lover of Grainne, while another famous historical character to bear the name was Diarmaid Mac Murchada, the King of Leinster in 1170, whose appeal for assistance in conquering his neighbours, was to lead to the ultimate Anglo-Norman invasion of Ireland. The Mac Dermotts in Ireland are one of the few septs whose head is an authentic chieftain, entitled to be called "The MacDermott". The variant form of "Kermode" arises from the sound of the name with the initial "D" in the Irish "MacDiarmada" being aspirated. Early examples of the name recordings include William Kermott, a witness at St Botolphs church in the city of London on March 1st 1617, Henry Kermode who married Catherine Keaney at Malew in the Isle of Man on the June 24th 1684, and William Kermatte, whose daughter Rosa was christened at St Thomas church, Stepney, on February 13th 1880. The first recorded spelling of the family name is shown to be that of Teag Mac Kermott. 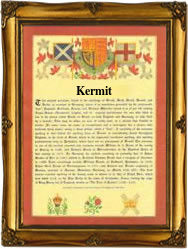 This was dated 1430, in the early rolls of the kingdon of Manks. Surnames became necessary when governments introduced personal taxation. In England this was known as Poll Tax. Throughout the centuries, surnames in every country have continued to "develop" often leading to astonishing variants of the original spelling.